Starring Alan Ladd, Jean Arthur, Van Heflin, Brandon De Wilde, Jack Palance, Ben Johnson, Edgar Buchanan, Emile Meyer, Elisha Cook Jr., Douglas Spencer, John Dierkes, Ellen Corby, Paul McVey. Among the great westerns George Stevens' Shane occupies a mighty high roost. Fans may be more gaga for John Wayne pictures or Clint Eastwood's Italian epics, but the title Shane is afforded a special respect. 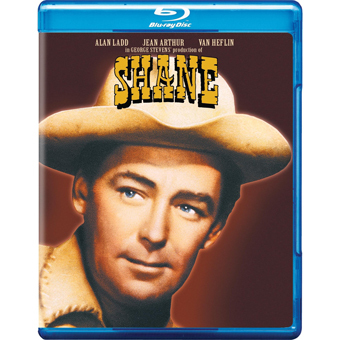 Although some Paramount executives at first considered it to be just another Alan Ladd vehicle, Shane was produced at a level of quality far above normal Hollywood product. Producer-director Stevens was among the most revered filmmakers in town, and one who got his way in all things. Months were spent on location in the Grand Tetons, and the editing process was long and intense. By the time the film was ready for release in 1953 the industry's conversion to widescreen projection had already begun, and Shane was often screened in a 'matted' version that mis-framed Stevens' exacting compositions. Warner/Paramount's new Blu-ray presents the film exactly as its director intended, in flat Academy (1.37:1) ratio. Screenwriter A.B. Guthrie Jr. also provided the source book for Howard Hawks' superb frontier western The Big Sky. His screenplay for Shane is adapted from a book by Jack Schaefer. A high plains range war is presented in realistic fashion, yet its leading character is a gunslinger sourced in pure sagebrush myth. Ten years later the revisionist westerns of Sam Peckinpah would eulogize obsolete gunmen struggling in a disappearing wild west, but the Eisenhower-era Shane carries dialogue to the exact same effect. Taken on its own, the raw storyline is unexceptional, generic. Wyoming cattlemen Rufus and Morgan Ryker (Emile Meyer & John Dierkes) hae fallen on hard times and are infuriated by the influx of homesteading "sodbusters and pig farmers". Newcomers Fred Lewis, Swede Shipstead and Stonewall Torrey (Edgar Buchanan, Douglas Spencer, Elisha Cook Jr.) rally around the charismatic Joe Starrett (Van Heflin), who is making a new start farming with his wife Marian (Jean Arthur) and son Joey (Brandon De Wilde). The hired gun Chris Calloway (Ben Johnson) fails to intimidate Starrett, so Ryker sends for the black-clad, snake-like Jack Wilson (Jack Palance). But the Starretts have their own champion, a mysterious white knight gunslinger known only as Shane (Alan Ladd). Shane hires on as a handyman seemingly out of sympathy for the Starretts. Marian feels an unacknowledged attraction for him. Shane initially refuses to be provoked into violence, but a house burning and some killings make a pacifist stance impossible. When Joe Starrett insists on a suicidal personal showdown with Jack Wilson, Shane realizes that the farmer doesn't have a chance. Shane must have dazzled audiences from the get-go. The noble cavalier enters slowly from the horizon, framed in the antlers of a buck deer. The healthy Starrett family has everything going for it, as the father is strong and the wife happy. The deer seems to know that little Joey isn't allowed any ammunition for his rifle. This is an American Garden of Eden under the snowy Rockies, free from smog, traffic congestion and tax collectors. George Stevens' direction is several notches above what viewers expected in a western. The characters may be conceived as stereotypes, but they couldn't be presented in greater depth. Joey is governed by curiosity and openness, and he takes an immediate liking to the mysterious stranger. Joe is moved by Shane's honesty; the bond of comradeship they form removing a stubborn tree trunk together is soon tested in fistfights against Ryker's men. Marian loves her husband but seems charmed by Shane's gentleness and good manners; it's obvious that she has at least a mild crush on him. Guthrie and Stevens idealize the settlers somewhat. All are upstanding, hardy pioneer types. The utterly uncomplicated Swedish family would seem a holdover from Stevens' I Remember Mama. Poor Elisha Cook Jr. is once again set up as the ultimate Fall Guy, even in pioneer garb: his hotheaded ex-confederate was born to be lured into one of Rufus Ryker's deadly traps. The story takes great pains to develop the villains in town. The cattlemen think they can buck progress by staving off the inevitable horde of farmers from the East. When the Rykers revert to the methods by which they took the land from the Native Americans, the settlers have no policemen to turn to for protection. The brutal Rufus Ryker claims to be a reasonable man -- just so long as his will prevails. In reality, more sophisticated cattlemen would band together in associations to lobby Washington. Real range wars were a mess of overlapping legal rights. Shane is known for its realism, a quality that doesn't extend much further than its authentic scenery, muddy streets and credible costumes. In most respects this is a by-the-numbers formula western that uses superior filmmaking skill to enliven what are consistently stereotypical relationships and situations. Shane is such a white-hat hero that he might as well be an angel from the great beyond. He arrives off the prairie fresh and clean, as if he just came from the dry cleaners. Shane is kind to small boys, square with the father and a dream partner for the frontier wife. And he's housebroken! When not showing Joey how to shoot like a man, he sets an example for table etiquette. John Ford told us to print the legend instead of the facts, but this 'realistic' epic tells us to print the myth instead of the legend. Director Stevens was fooling himself if he thought he was making an anti-violence western. Content-wise, this is standard escapist material: in the fistfights men receive dozens of blows to the head and come out with minor scratches. In his commentary George Stevens Jr. emphasizes that his father wanted to give audiences a real taste of the awful power of guns. But that reasoning doesn't take into account the fact that audiences everywhere love the way westerns glorify guns and violence. With its superior editing and audio, Shane makes gunplay more attractive than ever. Bolstered by terrific showdown suspense and punctuated by sound effects that make one think a cannon has been fired, the gunfights here are breathtaking. Warren Beatty was so impressed by the audio in Shane that for his Bonnie & Clyde he investigated the Paramount sound department's technique for making Shane's gunshots seem so loud. Shane displays a masterful control of audience reaction through shot selection and editing. Despite the expense of the 3-strip Technicolor process Stevens covered many scenes from all possible angles, and multiple distances for each angle. It may not look so on first glance, but Shane is phenomenally well edited. Stevens unerringly cuts to the perfect angle on the perfect frame, never drawing attention to technique or the presence of the camera. Obvious cutting patterns, as when the tree stump is chopped down, seem natural. The montage cutting in the fast scenes frequently uses bits of action just a few frames in length, yet we see everything we're meant to see. Stevens also knows when to refrain from cutting. By using only a couple of fairly static angles, Stevens amplifies tenfold the brutality of a certain shooting in the muddy town street. The jarring action within the frame makes the statement, along with a KABOOM sound effect. The movie has one awkward passage, involving Chris, a character played by favorite cowboy star Ben Johnson. Introduced as a major villain, Chris disappears from the continuity after just a few scenes. He then appears in an obvious re-shoot scene in which he quits the bad-guy racket. 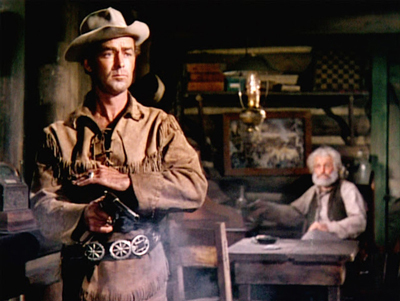 It may be that Stevens included the farewell scene, with Chris shaking hands with Shane, as a nod to Johnson's mentor John Ford, who may have still wanted to promote his contractee as a good-guy leading man. 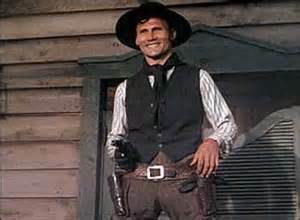 As it is, it appears that Stevens may have been unsatisfied with Johnson's acting, or that the "new guy in town" Jack Palance was so impressive that the Chris character was no longer needed. Shane immediately elevated Jack Palance to star status and was soon starring as a romantic lead. Shane also marks the discovery of child actor Brandon De Wilde, who gets the film's unforgettable farewell scene in which Joey appears to be begging for the return of old-fashioned heroic westerns, with their uncomplicated moral values. This was a one-shot comeback film for Stevens favorite Jean Arthur, who had called it quits after supposedly being treated badly on Billy Wilder's A Foreign Affair. Stevens handles Ms. Arthur with kid gloves, and cameraman Loyal Griggs supplies light diffusion on her close-ups. There's no denying that Shane is a superior film. It didn't meet with much favor back in the politicized atmosphere of the UCLA Film School circa 1972. Feminist author-critic Janey Place saw it as a retrograde stack of clichés supporting the status quo, an affirmation of basic genre lies about the frontier experience. Be that as it may, George Stevens simply wanted to entertain audiences as he saw fit. The same complaints apply much more strongly to Stevens' enormously entertaining Gunga Din, which sees the colonial oppression of India as an opportunity for violent slapstick comedy. Having left his comedy roots behind, George Stevens would devote his later films to sober humanist issues. Warners/Paramount's Blu-ray of Shane restores real beauty to a classic that for decades has been seen only in substandard copies. Even for its 1959 theatrical reissue the film prints were weak. Sharpness and color fidelity have improved so much that this restoration may have gone back to original Technicolor separation elements. The improved visuals allow us to appreciate the artfulness of the lighting, even in dark saloon interiors. Instead of a general blur, we can see the haze and atmospherics in the many vast landscape shots. Mountain overcast never looked this good -- so good that we remember how sharply the temperature can drop when a cloud passes over. 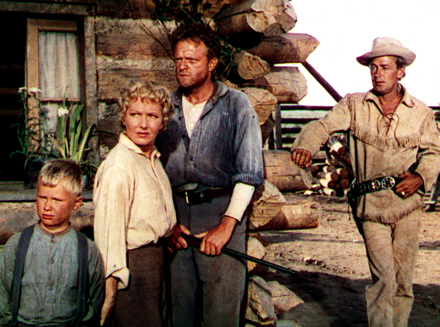 Shane was projected in widescreen for its first New York engagements in 1953, over George Stevens' objections. A petition circulated earlier this year by well-known film critics convinced Warners to reconfigure the Blu-ray at the Academy ratio intended by its director. Included as an extra is a widescreen-formatted reissue trailer that gives an idea of what the film would look like matted. In several shots character heads and snowy mountains are cropped away. In the final saloon gun-down every corner of the frame is important, especially when Morgan Ryker is hiding up a flight of stairs with a rifle. The commentary combines the thoughts of associate producer Ivan Moffat, and George Stevens Jr., the keeper of the flame for his father's legacy. We hear plenty of fascinating anecdotes about the location filming and the personnel; both men are impressed by director Stevens' accomplishment, sixty years later. Their comments about technical matters are usually relevant. Shane is so carefully assembled that the occasional process close-up is nigh undetectable. Some of the night scenes were indeed filmed in broad daylight, and then made day-for-night through clever Technicolor printing -- the trailer shows several night exteriors re-timed for broad daylight. Earlier transfers mistimed some of these scenes, but this new Blu-ray restores them to the proper night setting. Nobody mentions the physical symbolism that indicates that the phantom 'angel' gunslinger Shane is not long for this world. Riders enter the town by passing through a pair of young tree saplings. Trouble is foreshadowed when Joey takes a short cut through the cemetery on his dash to town. When Shane finally exits he's last seen among the same tombstones. As the myth goes, the valiant man of violence clears the way for a civilization that no longer has a place for him. 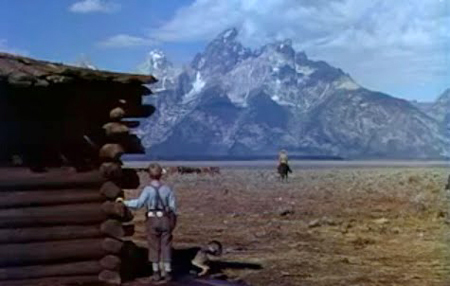 We're forced to conclude that George Stevens envisioned the filmic West as a place for optimistic American fairy tales. His next movie Giant would undercut many of the values celebrated here. Supplements: Commentary with associate producer Ivan Moffat and George Stevens Jr.